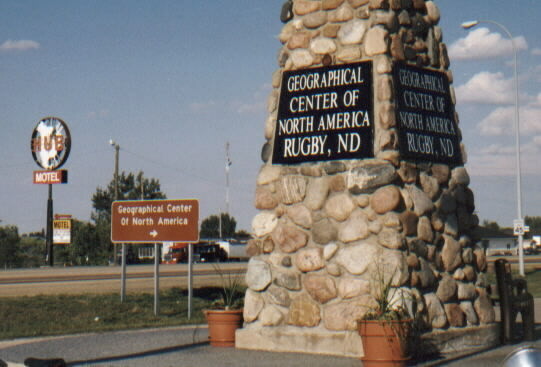 Monument at geographic center of North America, Rugby, North Dakota. A very interesting article in May 2004 National Geographic about the Great Plains of USA. North, South Dakota, Nebraska and so forth. Some counties where median age is 60 and still loosing population. Stagnate economies. Interesting irony, some of these sections of the Great Plains are politically conservative. People embrace hard work and lower taxes, yet the economies are stagnate. In some towns, the funeral home may be close to the only thriving business, but housing is affordable. On the other hand, some of the politically liberal places, like San Francisco Bay area in California, have booming economies and un affordable housing. Where they talk hard work and low taxes, there is nothing to do. Where they talk justice for poor people and "down with the corporations," one must just about be a millionaire to live there. Every ideology seems to not match reality at times. 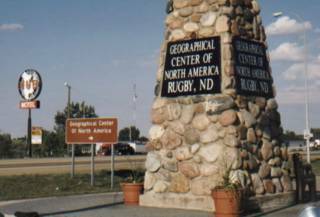 See my short essay about Crossing North Dakota by bicycle.